Jurriaan de Jong has researched extensively in buyer-supplier relationships and remanufacturing in the health care supply chain. In particular, his research has focused on the role of inter-organizational power and dependence in the Group Purchasing Organization-driven health care supply chain. He investigates the buyer-supplier and buyer-middleman relationships in the GPO and their effects on health care supply chain member performance. Furthermore, De Jong studies the various decisions made by the health care supply chain members, including an OEM’s pricing decision for new and refurbished product offerings and service contracts, a GPO’s choice for OEMs for a product group and an HCO’s decision with respect to GPO service usage and procurement of new versus refurbished equipment. Prior to his academic career, De Jong spent many years in industry in a variety of managerial, consulting and industrial engineering roles. 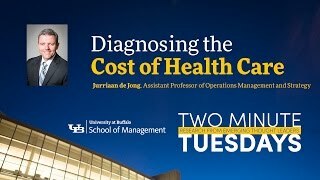 Jurriaan de Jong on supply chain costs in the health care industry (co-authored with Nallan Suresh).